Wow, we love these, it's curious , we haven't had a single pair of these for about a 5 year stretch, then we scored 2 pairs in the last year buying trip and were fortunate 2 find 2 more pairs this tlast trip. This pair which is attributed to to one of the French builder Erton. We even have a copy of their original sales catalog. Sweeping, gorgeous arms and a huge rollback create an powerful statement. 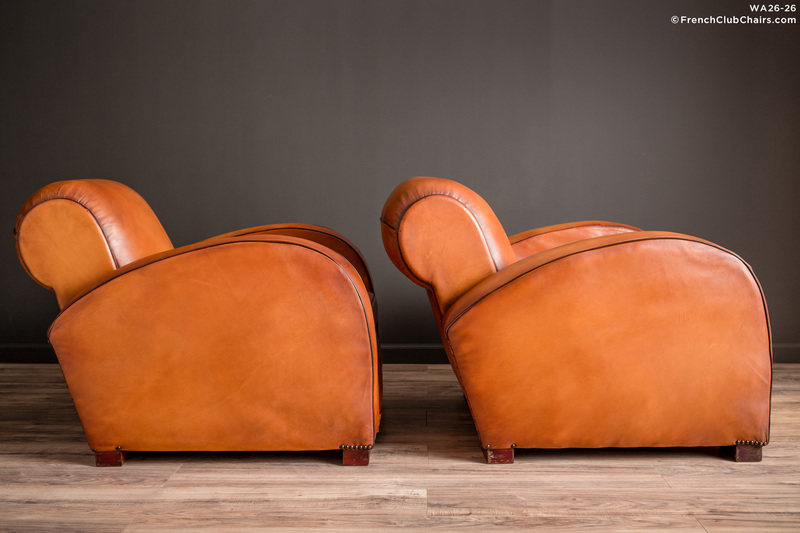 We restored this pair in France with our signature Pyrenees sheephide, they have been spray and hand dyed to achieve a rich color that will soften and deepen in the years to come. The have a rather deep seat at 24.5 inches. A shorter client mind need a back pillow. They are from approx 1945.